The perfect works are the result of time you invest on it. Based on that phrase, much used by the CEO of GESAB, Pere Sabaté, and leitmotif of the human team of the company, began a process of more than two years of work. A development that is nearing completion. 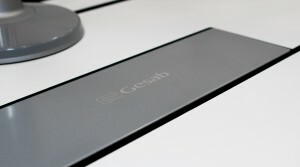 Soon, GESAB will present something new, different, innovative, surprising. And we are going to tell you righ here. The R&D is now, more than ever before, the fuel of an engine that never stops. Neurons inside a collective brain that never surrenders and that strives for excellence through the imagination, solidarity, efficiency and innovation. More than two years of dialogue, proposals and sketches that sometimes go to the trash but, ultimately, of wills and skills that come together in one place: to provide the best technology and the most effective design for companies, today and tomorrow, to be competitive and profitable. Perfection does not exist, but all accross the hard trail to find it, there are incredible findings. GESAB wants to share with you their latest creation. And it will be soon. ← INSIDE GESAB: Ecooling system; efficiency and effectiveness.